After taking a break for the holidays and to get more stuff done around the house, I’m really hoping to get back onto a regular blogging schedule, like I used to be. 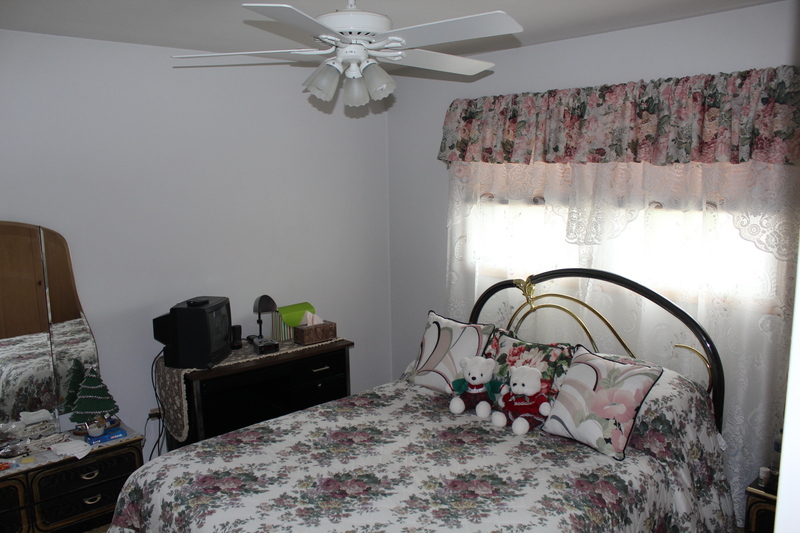 For now, I thought I’d share the quick and affordable update we made to the guest room. Let me paint you a picture. On inspection day, the room looked like this. Believe it or not, this was not one of the worst rooms in the place when we bought it. Here it is on move in day. 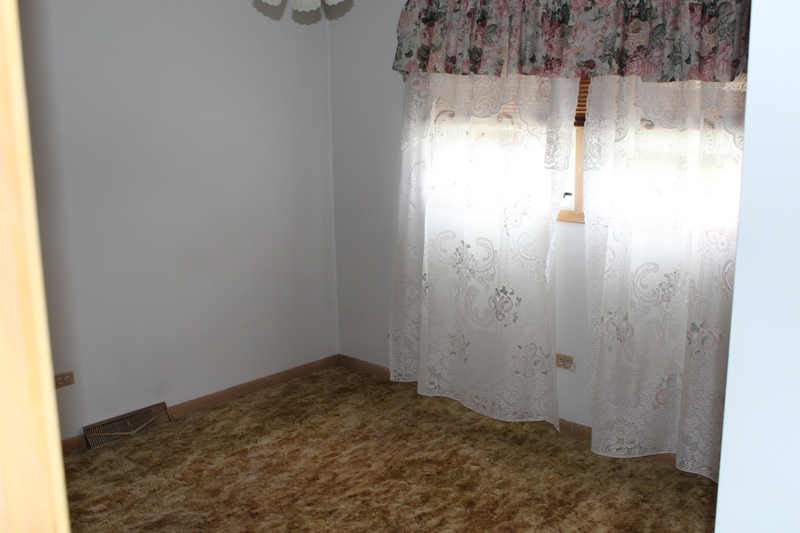 That carpet, those curtains. Oh dear. I was going to post the in-between photos to show you it’s couple stages before we get to today, but I thought it might be better just to show you the finished product. 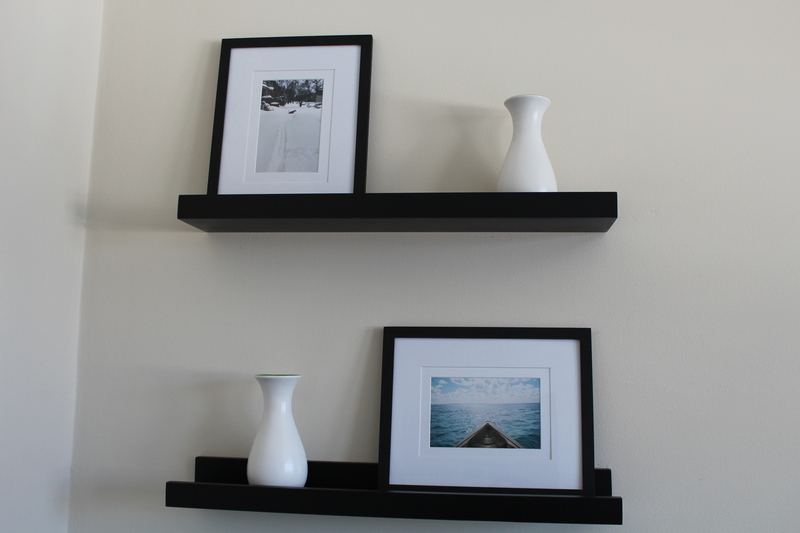 Would you believe me if I told you this makeover was pretty inexpensive? I did this update on the cheap by trying to use what we already had around the house, and buying only a few new essentials. Take that desk in the corner. I’ll chronicle how we updated it in another post, but for now, I’ll just say that we were able to score this solid wood, antique desk at a yard sale for $7. That chair was only $5 at a different garage sale. The bed, nightstand (a stool), and lamp were all items we had on hand. And by shopping around and hitting the right sales, I was able to score the 5×8 Mohawk rug from Kohls, and the sheets and duvet cover from Target for around $80 total. Same thing for the accessories. The shelves hanging over the desk are a kit that included the shelves and frames and cost only $10 on clearance at Target. The gold plated candle holder on the nightstand was a clearance item from an after Christmas sale for about $4. That gold pencil holder was just an old wire one that Dan spray painted gold. Oh, and that fun screen printed burlap calendar was just $7 from, get this, Land of Nod! It was really fun to decorate a guest room because I think you get to be a little more bold in your choices. Take the gold accents. I love how shiny and bright they are, but I’m not sure I’d put them in another room since our color scheme is mostly blues and greys. 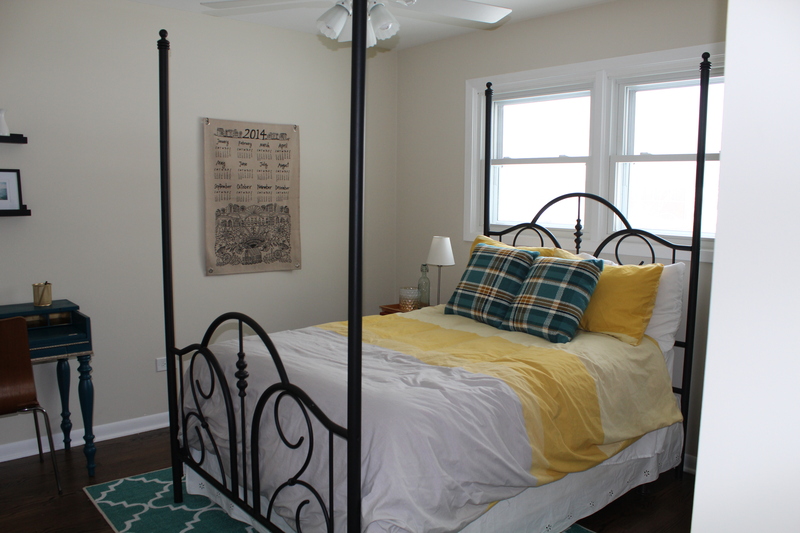 Here though, the gold and yellow in the bedspread is warm and charming – so inviting for a guest room. I’m sure we’ll still be adding some things here and there, like maybe a proper nightstand, and updating items like the desk chair, but I think it’s looking pretty good for now.